Those of you who regularly follow our blog are no strangers to our Taste of Hawaii series where we feature some of the unique foods you’ll find here in paradise. Part of what makes a Hawaii vacation so special is the variety of exciting new tastes to explore. Here on our Hawaii blog, we’ve featured Poke, Shave Ice, Malasadas and Poi among Hawaii’s other delicious onos (treats), and today we introduce you to the magic that we call Mochi! Mochi is essentially a sweet and chewy rice cake, yet that description doesn’t come close to doing it justice. Brought to Hawaii by Japanese plantation workers in the 1800’s, mochi has a long history dating back to the late 700’s. Ancient samurai’s would take mochi with them when they journeyed for battle as it was easy to prepare and traveled well. Throughout history, it was consumed to bring good fortune, happiness, health, long life and general well-being. Mochi is still made in ceremony today, and is a time honored tradition in Japan’s New Year’s celebrations as family and friends take turns pounding the mochi to bring prosperity and peace in to the New Year. The making of mochi is considered an art form and after tasting it, you’ll understand why. Rice is soaked overnight, steamed and then placed in to a large stone or wooden bowl where it is pounded until it is a smooth and soft consistency. This is blended with condensed or coconut milk and sugar, rolled in to balls or patties which are then served up in an endlessly delicious number of ways . It can be toasted, baked, eaten as a candy or dessert filled with fruit, ice cream and other sweets or served in its more glutinous form with soups and bubble tea. Here in Hawaii, you’ll find a variety of mochi. From Kushi dango (mochi balls in sweet soy sauce), to Ishigo Daifuku (mochi filled with red bean paste), to peanut butter or salted caramel mochi, to our favorite, Butter mochi (mochi, butter, sugar, and coconut combined then baked in to a sweet cake). 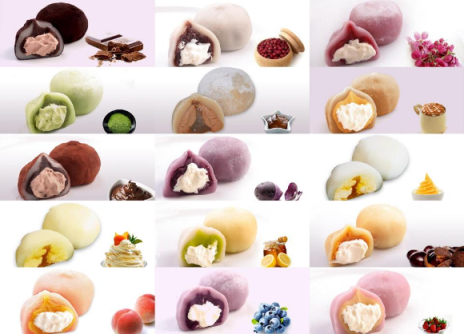 There is a long list of mochi varieties and we’re certain that none of them will disappoint. If you have questions regarding which of the above is closest to your Hawaii vacation rental property, our concierge is always on-hand and happy to help. We wish you an Aloha filled day, and we hope to see you here in Hawaii soon!